If you are confused by the different ways to connect to the Internet, and by words like “Dial Up”, “ADSL”, “3G”, “GPRS”, “WIFI” connections we attempt to unravel the mysteries here, by at least explaining what they are! It would take a whole book to explain the details of each of these connection methods, but at least after reading this your curiosity should be satisfied, and hopefully you will be a little more “in the know”. There are numerous ways to connect to the web because of the way we live our lives, both at home and in business. We use the Internet at home on a PC, or on the move either via the use of a laptop or by mobile phone. Each device has various methods and technologies provided in the form of electronic “rules” which utilise the capabilities of each device, allowing it to connect. A particular technology for instance, such as 3G is used in mobile broadband networks, but Broadband at home, as a general rule utilises the ADSL method to connect to the web. Dial up was the first method of connecting to the web. It uses the telephone line and therefore the telephone cannot be used while the connection is taking place. The user’s computer uses a modem to “dial out” to a number provided by their Internet service provider (ISP). At the ISP end of the connection another modem translates the message into a suitable form for use on the web. These Internet protocol “packets” as they are known are transmitted to various host computers on the web, which return web pages or email information, etc. Dial up is still used, but it has been succeeded by broadband as the main method of connecting to the web. At home most of us use broadband. This occurs through what is called Asymmetric Digital Subscriber Line or ADSL for short. This is a data communications technology as opposed to the voice range of transmission provided as previously described by “dial up”. There are some frequencies not used for standard telephone calls. It is these frequencies which are utilised by the ADSL technology. The frequencies are “split” into two distinct ranges, one used for voice calls, and the remainder used to provide access to the Internet. Hence the reason why, in ADSL the same phone line can be used to make phone calls and connect to the Internet, unlike “dial-up” which takes complete control of the phone line. The “splitting” of the frequencies does not happen automatically, it is achieved via the use of a microfilter which is attached to the phone line. ADSL is fast, but it only works well over short distances, typically less than 4km. However, the average house is not 4km in length, so it is not a common problem! 3G is used in mobile phone networks, to offer mobile video, wireless voice telephony and wireless broadband on the move. In the right reception area, 3G can harness a fast method/protocol, i.e. “High Speed Downlink Packet Access” (HSDPA) technology in order to churn out fast Internet access on the go. As the name implies, 3G is third generation mobile phone standards and technology. Unlike local wireless networks, such as WIFI, 3G networks are wide area mobile telephone networks and can handle several million connections at the same time. Initially 3G did not have Internet access and video telephony, but this was added later. The General Packet Radio Service (GPRS) is available to only a subset of mobile phone users. The speeds for GPRS are not as good as those used by 3G, but it was existence long before 3G came about. It is only available to “Global System for Mobile Communication” users (GSM) and IS-136 mobile phones. It is still widely used, but becoming less so as further technological advances are made. Wireless home networks, video games and mobile phones with built-in WIFI can access the Internet at home, where there is a wireless router. 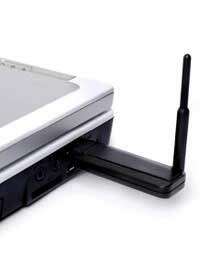 Wi-Fi is used by almost every modern computer network and operating system. It is also used on games machines, laptops and many peripherals associated with a computing system. In a nutshell, there are many ways we can connect to the web, but different rules come into play when we use different devices.